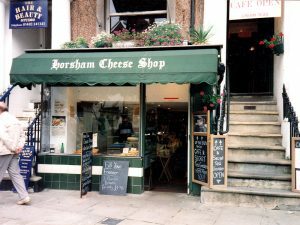 For anyone of a cheesy disposition and a long stay Horshamite, you will remember Lesley running her fabulous, renowned cheese shop in the town. Starting off in a multi-occupied site in East Street, she soon clinched her own shop in the middle of the Carfax (now Shakeaway) and then rolled just across the flagstones to the North side next to Frank Wilkinson’s Candy Box. 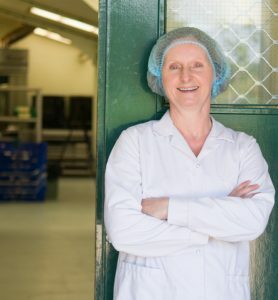 Lesley moved on from Horsham Cheese Shop many years later but remained working with her passion – food, helping others achieve her own high standards as a fine food consultant. More recently, she has turned her attention to reviving the town’s appetite for gingerbread and, indeed, Sussex heritage for all manner of long lost food delicacies. Today’s Horsham Gingerbread is born from a collaboration between Lesley, the Friends of Horsham Museum and curator Jeremy Knight discovering a Regency recipe. Lesley has brought it up to date and taken it in to full production. You can read the full story here and learn about Lesley’s other offerings such as Sussex Alberts and Lemon Puddle Thins based on Sussex Pond Pudding. 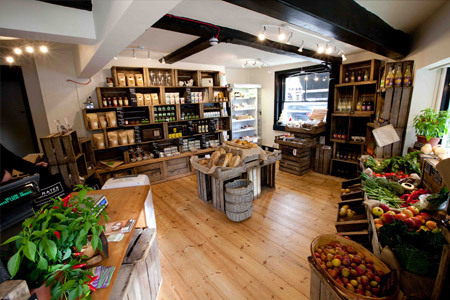 You will find Horsham Gingerbread all over the county including Horsham Museum and , of course, the full range at Crates Local in the Carfax just a few doors up from where Horsham Cheese Shop used to be. For the duration of Horsham District Food & Drink Festival, we will focus on many of our local producers. A few are already featured for real in our windows on the Carfax, others will feature virtually!